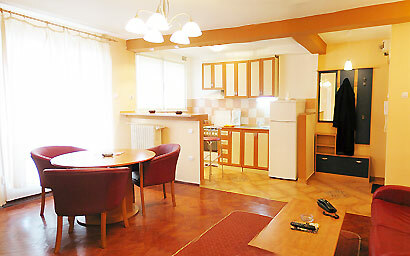 EastComfort offers apartment rentals in the center of Bucharest. View all apartments from EastComfort and select a short term apartment in Bucharest by our recommendations or by price. The rental apartment's main advantage is the location, being well-appointed in the heart of Bucharest. The cosy rooms offer home from home comfort with TV, air conditioning, leather sofa and armchairs, fully fitted open kitchen and a luxury applied bathroom. Athenee Palace, Hilton or Intercontinental Hotels, Lido, Ambasador), elegant casino (Casa Vernescu â€“ close to diverse night clubs from Bucharest), quality eating places (McDonaldâ€™s, Planet Dinner, Hungry Dragon, Pizza Hut), places where you can listen good music (Art Jazz Club, Green Hours 22 Club Jazz Café). Overlooking, most central outdoor markets, a fine place to buy superb fruit and vegetables brought in from all over the country. At the ground floor there are a supermarket and a pharmacy. Another supermarket is open across the street.